The Somali Athletics Federation will select one female runner from a field of 10 to compete in the 400-metres at this year's London Olympics. The youngest of those currently training in Mogadishu is Najma, 10. She started running six months ago, shortly after Al-Shabab left the city. “My father encouraged me,” said Najma. She knows she is lucky - most girls in Somalia do not enjoy such freedom. The head coach of the Athletics Federation, Ahmed Ali Abikar, said it is very difficult for female athletes in Mogadishu to train. "Society doesn't understand about sport for girls. They cannot train everywhere, they are teased. But they know why they're doing it," he said. Najma and Leila, 15, meet every Saturday to race around the 400m track at the bullet-ridden Konis Stadium in downtown Mogadishu, a city which until August 2011 was occupied by Al-Shabab insurgents. Leila, a slight and self-possessed young woman with a bright red scarf covering her hair and glittering gold earrings, remembers a time when she had to conceal her tracksuit beneath a burka until she was in a secure compound where it was safe to run. "The stadiums were closed because of the fighting", she said. Leila has been training for three years and says she has always been interested in sport - something which both the mayor of Mogadishu and the prime minister of Somalia regularly express their desire to promote. She says girls in Mogadishu can now choose from basketball, handball and athletics. "When I'm running, I'm happy. It gives me real pleasure", she said. Determined girls like Leila are staking their claim to freedom and choice. Nick Birnback, spokesperson for the UN Political Office for Somalia (UNPOS), agrees that change is in the air. Following the decision to grant women 30 percent representation in parliament, he said many had sought advice from UNPOS to understand their rights and request support. “They're willing to be really engaged in the political process knowing that the context of Mogadishu is a very hard environment,” he said. At a February conference in Garowe, the administrative capital of Puntland, the Transitional Federal Government (TFG) convened the second in a string of UNPOS-facilitated meetings to work towards the completion of, and transition to, a new constitution by 20 August 2012. Currently women have 12 percent representation in government, but it was agreed that in the new federal parliament of Somalia they will have at least 30 percent. The head of the Somali Women's Federation, Asha Omar, is another determined character. She was responsible for organizing Women's Day celebrations in Mogadishu this year. Omar returned to Somalia two years ago after 21 years in Sweden. “We are the peace-lords, we're working hard,” she said. “It's the men who left their work - they're just fighting between themselves. Everyone wants to be a president. I tell them, be a president in your own home." Omar says decades of male migration and drought have promoted women to non-traditional roles; many now are at the head of their families. "Women have no tribes, they have families", she explained, adding that Somali women lose their ties to the clan structure on marriage. However, on women running for parliamentary office, Omar warned that because the clan structure has no tradition of female leadership, it will be a case of the men choosing for them, perpetuating inequality. Abdi Hosh, TFG minister for constitution, described this year's Women's Day celebrations as historic. "It was the first such event I ever observed in Somalia; it was the first such event held at the venue in 21 years, as it was being used by IDPs [internally displaced persons], and it was significant for me because I fought for 30 percent membership for women in the next parliament," he said. 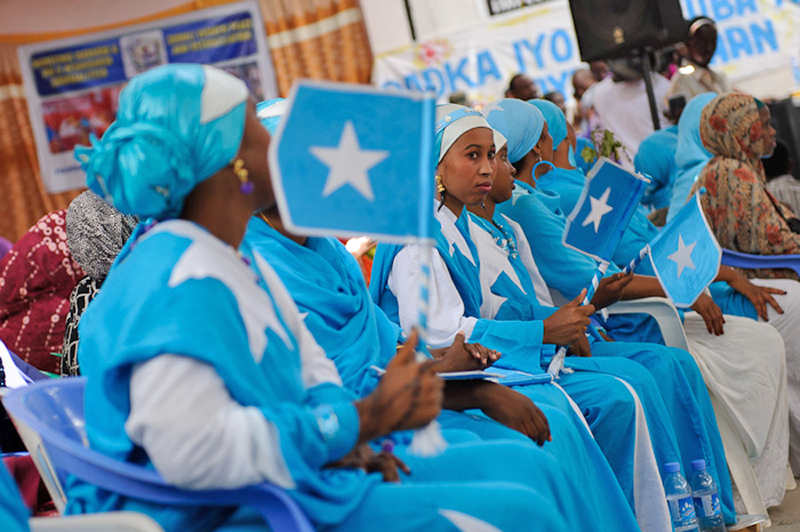 The city centre was awash with the vibrant colours of ceremonial outfits, hand-painted signs and flags, with many wearing matching turquoise and white dresses in the print of the Somali flag. "We are wearing the same dresses to show we are organized", said Hawa, a 22-year-old from Mogadishu, at the celebrations. But a source at the Ministry for Information described the move towards 30 percent representation in parliament as a “gesture”. He called for action: economic empowerment such as loans for women, mandatory education for girls, a legal framework to promote equal rights and “a sensible reinterpretation” of social, traditional and religious norms. Many of the women entering politics in Mogadishu now are either from the diaspora, or have spent time in Nairobi - like Omar. While some women are returning to Somalia, many are still moving away. Ahmed Ali Abikar, the athletics coach, has dealt with the disappointment of promising runners moving abroad to seek better opportunities. Samia Yusuf Omar, the girl he trained to run for Somalia at the Beijing Olympics, now lives in Ethiopia having made contacts abroad through her training with the Somali team. Mo Farah, one of Britain’s top Olympic hopes whose family fled Mogadishu shortly before the fall of the Said Barre's regime, is perhaps the most high profile example of this. Osman, a 66-year-old security guard at Konis Stadium, says he has not missed one day of work in the last 21 years, and has bandages covering the bullet wounds on his left arm and right ankle to show for it. He will be watching Somalia's Olympic runners on TV and firmly believes sport for females will continue to win acceptance. "They can't help but play," he said, of the young girls and boys who use the track. "It's good for everyone." Somalia has been caught up in a devastating 20-year civil war. Al Shabab militants have threatened to carry on their war against the government and the African Union despite having been evicted from much of Mogadishu and losing territory to Kenyan and Ethiopian troops in the south: Two top Somali sports officials were among at least six killed by a suicide bomber in a Mogadishu theatre in early April.